Ready to Donate Your Rosaries? In early 2003, we were in the midst of what Pope John Paul II declared The Year of the Rosary (Oct 2002-Oct 2003). It was an amazing time for many Catholics, as interest in the Rosary was at a higher level than it had been for decades (pun intended). With the introduction of the new Luminous Mysteries of the Rosary, the beautiful Apostolic Letter Rosarium Virginis Mariae, and countless new resources about the Rosary, people were falling in love with this timeless prayer all over again. For us at Rosary Army, it seems nothing short of Providential that just a month before the announcement of the Year of the Rosary that we began our mission of making, praying, and giving away all-twine knotted Rosaries and encouraging others to do the same. In addition to this core mission which we’ve been devoted to since 2002, we have been blessed to branch out into many unexpected areas as lead by the Holy Spirit. And we’re not the only ones to have been blessed by this apostolate. When I converted, one of the first things I found was the Rosary and your website. That was 3 years ago. Today, I am at Ave Maria University where every night we have a Rosary Walk. We walk our campus and recite the Rosary for the intentions of our Holy Father. Thank you for the great podcasts that helped me to find the wonders of Our Lord through Our Lady. I will not only offer you my prayers but my encouragement as well. You have done such a wonderful job in the past and for at least a year I kept looking for more from you. You just plant little seeds or water the seeds that are already there and God will help provide the growth. Keep up the good work. There is a fire that is beginning to grow around this country. God bless. He wants this to grow & He will help you. It is testimonies like these that illustrate just how vitally important this apostolate is to so many people, and how so many people have been blessed by Rosary Army. One area where we’ve been blessed is that we made a promise to ourselves to always trust Jesus and Mary that we’d always have everything we need to continue this work. We also promised that we’d only ask for money if we truly needed it. In fact, since Rosary Army’s inception in 2002, we’ve only conducted four fund drives. We’ve only asked for your help four times. Would you consider helping us spread the love? We will always desperately need your help to make sure Rosary Army can continue the important work in bringing people closer to Jesus and His mother through the making, praying, and giving away of all-twine knotted Rosaries, as well as through our various catechetical ministries such as our free multimedia offerings of That Catholic Show, Total Consecration, Downloadable Audio Rosaries, and our archive of over 250 other free audio programs. Annually, Rosary Army needs $50,000 to operate efficiently. And this is a bare-bones operational budget that will just barely cover the costs of our storage, utilities, office equipment, administrative costs, shipping expenses to send thousands of Rosaries a year, employee compensation, as well as additional fees for legal, accounting, and consultancy needs. Please help make a difference in this apostolate. We need your continued support! To make an automatically recurring monthly donation via PayPal, please visit our Donate Page and click on a suggested donation amount. Rosary Army is a 501(c)3 non-profit organization and all of your donations are fully tax deductible. If you can help us by donating $20, $50, $100 or more (or any amount for that matter), it would be greatly appreciated. Continued to make freely available our Scriptural and Standard Rosary MP3s. These files alone have been FREELY downloaded over millions of times! Continue to make available an archive of nearly 250 episodes of the Rosary Army Catholic Podcast, as well as individual audio files regarding Natural Family Planning and Total Consecration to Jesus. Conducted multiple workshops and talks at major Catholic conferences in multiple states and parishes and groups – including RA Workshops in the Netherlands and other countries. Rosary Army’s founders organized the first ever Catholic New Media Celebration, in cooperation with SQPN.com and other Catholic non-profit organizations, to expand Catholic new media outreach worldwide. Directly distributed thousands and thousands of Rosaries via direct mailings, at conferences, at workshops, at other Catholic events. 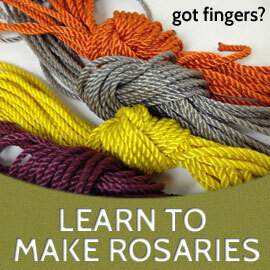 Been responsible for managing thousands of volunteer hours from people making Rosaries for others. Worked with our Archdiocese to ensure RA is faithfully Catholic, and to help spread podcasting as a means of evangelization. We have received the blessing of the Archbishop on the RA apostolate, on our podcast, and on the work of That Catholic Show. On top of all of this, there are multiple other activities in which Rosary Army plays an active role, including regularly offering free Catholic New Media consultation to other Catholic apostolates (including CatholicTV in Boston, Catholic Answers in California, GraceBeforeMeals.com, and SQPN.com in the US and Europe, in addition to several publications and other media outlets). Please don’t wait. We need your help right away. Thank you in advance for your ongoing support of Rosary Army. Click here to make your donation today.